Search Results for "traditional chinese weaving"
Chinese workers weave on a hand loom with great speed and accuracy. The ancient art of weaving silk in the isolated town of Chengdu, China in 1940. 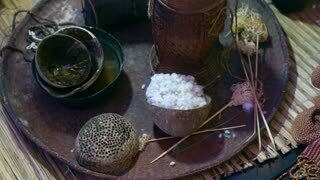 Stick rice boil steam in weaving bamboo and pot, HD Clip. A happy Asian man smiles at the camera. 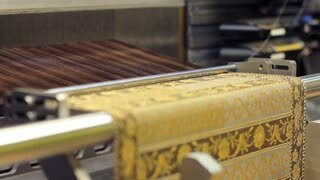 Weaver is adjusting vintage wooden weaving machine and weaves a traditional belt. Traditional textile manufacture in craft village where old women work on wooden weaving loom machines and spin yarn creating silk or cotton fabric. 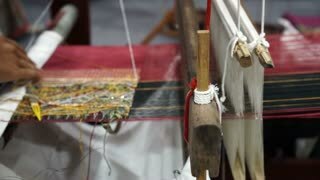 Silk weaving in Thailand. Indigenous woman, from Guatemala, weaving a traditional guipil. Weaving a traditional scarf. Nepal, Himalayas. Man weaving grass together to make roofing material for a traditional African hut. 1960s: A woman wears traditional Peruvian clothing, she sits on the ground and weaves. The hands of a woman who weaves on the ground.